I own this little MMO gaming blog but I hardly ever write on it any more. I'm more of a bloglord or something. Thankfully I have several minions to keep things rolling along. I’ve been making Rav’s Halloween chili over the past 5 years and it has become a family favorite. In honor of Ravious, I’d like to re-share it for you all before Halloween arrives. Also, please consider a donation in his honor to Child’s Play. Thanks! I was bored today and decided to see when I first posted here. Turns out it was in May of 2004. Has this site really been going for over 10 years? Yikes. Posted on August 28, 2014 August 28, 2014 Author EthicCategories Asides5 Comments on 10 Years? A while back we received an awesome fan email with some cool art attached and, well, I thought it was really awesome so I wanted to share it. I want to thank Jonas from Foxygamer for creating it and also for being a fan. You rock! The way I play Guild Wars 2 may not be the way everyone else does, but I always manage to entertain myself. Over the weekend, in between doing some storyline quests with my son, we decided to start jumping off the bridges in Rata Sum and see how far down we could get. Frequently we would land at the very bottom (splat) and laugh. Soon after that we decided to try jumping off the outside of Rata Sum and see how far down we could slide before some abrupt edge would stop us dead. Eventually we slid right up to and over the edge, watching our bodies fall (and die in mid-air) all the way down into a lake – waiting for a revive that isn’t coming. This gave us an idea. My son ran back to his bank and grabbed his revive orb and jumped off again. He self-revived and then revived me and we set out to explore this area we have never seen before. We were actually underneath Rata Sum. We could swim under the giant cube shaped city. 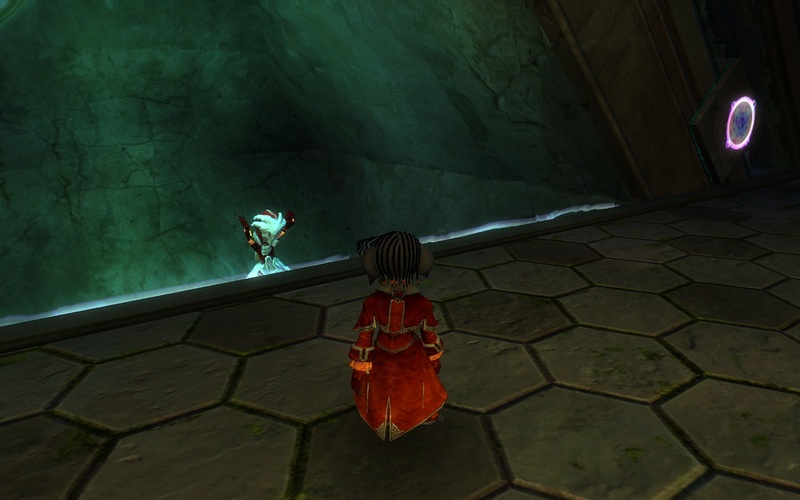 We found a few interesting things, like Zojja’s lab even though they ignored us and the portals didn’t work. I saw an interesting looking structure and decided to go look at it but before I got there I was teleported into a prison cell deep inside Rata Sum. This was hilarious to me. I ported out because I wanted to find the prison from the outside of the cell as I had never noticed it before. By the time I found it, my son had also been teleported into the jail cell. This adventure is something we will not soon forget. It was so much fun we couldn’t stop laughing. I half expected a developer to pop into the cell and yell at me because I assumed we must have gone somewhere we shouldn’t have. After this happened I spent some time searching the internet and it appears to be a pretty well known place, but for a while there it felt like we were the first people ever to find this unexplored area and it was wonderful. Have you ever wandered into an interesting location in a game only to realize afterwards you should not have been there? Or just found something strange or unusual that you might not normally find during typical game play? My son and I were hunting in a level 30ish area when we came upon a champion. It was a long fight and several others joined in during the battle to make it a success. I started to run off and look at my loot but he tells me to hold on as he wants to grab a souvenir. I turn around to look and here he comes running carrying a huge bomb! I just did not expect that. He then ran over and dropped it by a cute white bunny and next thing I know he had earned an achievement for master of overkill with over 10,000 damage. For the rest of the evening, he was looking for souvenirs. Even if it was a rake or a hoe, he just had to grab something on the way out of a battle. It became a running joke for us all night. Like I said, you probably had to be there but it still makes me smile. I recently spent over an hour chatting with Brian “Psychochild” Green about his latest project, Storybricks. I had to be honest with him and explained that I just did not give Storybricks the time it deserved. I took a glance at it, didn’t “get” it, and moved on. Therefore, I wanted to give him a chance to help me understand just what exactly are they trying to do. I feel their biggest problem is that people are trying to relate it to anything else currently out there and falling short. It is easy to explain something by saying “It’s sort of like this.” but there is nothing sort of like this. Truth be told, they really have something new and interesting on their hands and it would be a terrible shame if this project failed due to nothing more than people not understanding it. It was not easy to narrow down to a group of 20 finalists for the M.M.O. 7 Gaming Mouse Giveaway, but I managed. For the record, these are the top 20 I selected: Adam, atx, Teer, Syl, Jasen, Bloodchild, Amarok, Daniel, Masael255, Cody, mbp, Sg McManus, Robbie, Kemica, James, CrashBomber, Brian J, Defarious, Alex Goresch and Chris. Mad Catz/Cyborg Gaming has been kind enough to send us a brand new, $129.99 retail value, M.M.O. 7 gaming mouse to give away to one of our readers. If you are not aware of this beast of a mouse, one that scares small children and pets, read on. My son and I are still happily playing Star Wars: The Old Republic with our Jedi characters. We have reached level 14. We’ve tried a few Heroic quests and a Flashpoint but most were a little too difficult for us at the level we attempted them. Regardless, there are a lot of quests to do and stories to play out and we are loving every minute of it. It’s been a long time since I’ve played a game that I had fun with and was in no rush to finish. I feel no need to hurry up to catch up with friends, no big item hanging in front of me to rush towards. Just plain fun play. This past weekend was called “Weekend Pass” for Star Wars: The Old Republic, which granted new players a chance to try it out for 4 days without needing to spend any money. I took the opportunity to see how my favorite method of gaming (the duo) works in SWTOR. I enlisted my son to be my “other half”.